Wooden USS Constitution Tall Model Ship 7"
The Black Prince is a highly accurate and detailed scale model yacht designed for the discriminating sailboat or tall ship enthusiast. This museum quality tall model ship is a replica topsail schooner of the first privateer with Letters of Marque by the Continental Congress during the Revolutionary War, and commissioned by Benjamin Franklin himself. 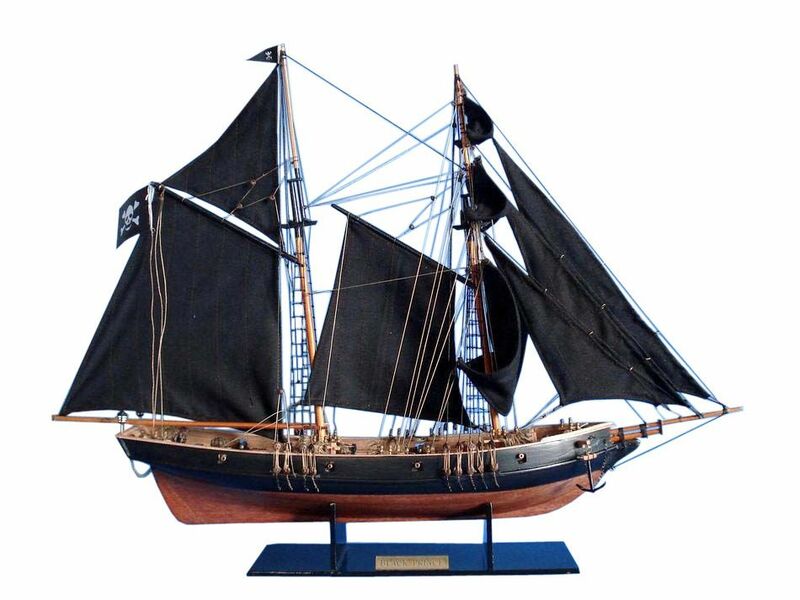 This fine tall ships model is authentically painted and rigged in black, which earned the Black Prince both her name as well as a reputation as a nighttime terror in British waters, and she will bring an added spirit of excitement and adventure to any home or office as she sits perfectly sized for any small shelf, desk or mantle. When we think of Benjamin Franklin, most of us picture the famous paintings of our bespectacled forefather. From his lofty vantage point on museum walls, he smiles gently down upon us, his American children. Or we picture him from the pages of our childhood history books, flying a kite with a key tied to its string on a stormy Philadelphia night. Few of us associate Benjamin Franklin with any form of piracy. But in fact, our mild-mannered Doctor Franklin was the political mastermind, who commissioned one of the most amazing privateering ventures in American history! In the early days of the American Revolution, the British had far greater numbers of American prisoners in custody than the Americans had British. Conditions in British prisons were horrific, and for those unfortunate souls who had the misfortune to be held aboard a British prison ship, conditions were unspeakable. Filth, disease, starvation and exposure took their toll on the Americans who languished in captivity. The numbers are staggering. An estimated 13,000 Americans, many now forgotten by history, perished on British prison ships in comparison to the 4,300 killed in the actual battles of the American Revolution. As tales of horror trickled out from the darkest corners of these British hellholes, their words gnawed like rats at the heart of Benjamin Franklin. He instigated negotiations for prisoner exchanges with the British, but quickly realized that there were far more imprisoned Americans than there were captured British soldiers to trade for them. So what was the good Doctor Franklin to do about this discrepancy? His answer was to capture a few more Brits! And by far, the most effective way to accomplish this was not to send one’s soldiers out onto the battlefields, but to commission privateers to capture them from among the British merchantmen at sea. So Franklin set about commissioning a small but stealthy pack of sea-wolves to do his bidding. Benjamin Franklin’s served the Continental Congress as "Minister Plenipotentiary.” Minister Plenipotentiary is defined as "A diplomatic representative ranking below an ambassador but having full governmental power and authority; a plenipotentiary." This enabled Franklin to issue Letters of Marque with the authority of the Continental Congress. Letters of Marque authorized a privately owned vessel to make captures on behalf of a country at war. But American privateering commissions were not recognized as such. Having not yet gained her independence from Britain, the Continental Congress technically could not issue Letters of Marque, The American colonies were no more than unruly factions under British rule. Captured privateers who operated under an American commission, were not granted prisoner of war status by the British. They were regarded as pirates, rebels or murderers and could expect to end their days in the noose. But nonetheless, in March of 1776, congress passed the Privateering resolution, which granted colonists the right "…to fit out armed vessels to cruize on the enemies of these United Colonies." The first ship to gain Benjamin Franklin’s American privateering commission was the “Black Prince”, a French-owned vessel so named for it’s black hull and near-legendary prowess and speed as a rumrunner. The Black Prince was crewed by Irish smugglers who would split the profits from the venture with the vessel’s owner. Franklin himself took no profit from privateering. His sole interest lay in the procurement of British prisoners for trade. The Black Prince underwent extensive improvements to prepare her for this daunting task of Benjamin Franklin’s. She was approximately sixty-five feet in length by twenty feet in her beam (width). Her hold was retrofitted to accommodate fifty or more hammocks and small sleeping cubbyholes for her officers. She was armed with sixteen 4-pounder guns and thirty swivels. The Black Prince enjoyed a brilliant solo career, capturing an impressive thirty-five vessels before being joined by the Black Princess, who served as her consort ship. The Black Princess was “…a cutter of 60 feet keel & 20 feet beam mounting 16 three pounders and 24 swivels & Small arms with 65 men all Americans and Irish under the command of Capn Edward Marcartor of Boston." Together, the two ships terrorized British merchant shipping channels, thwarting all attempts to stop them and successfully capturing twenty prizes. "…we continue to insult the Coasts of the Lords of the Ocean with our little cruisers” Franklin wrote to Congress when describing his fleet’s progress. The Black Prince and Princess continued their assaults until disaster struck on April 6th of 1780, when the Black Prince met her end as she struck a reef during an engagement along the coast of France. Lastly, the "Fearnot" joined Franklin’s black fleet, sailing independently of the Black Princess. She was "…A fine large cutter" which was equipped with eighteen six-pounder guns and twenty swivels. Between 1779 and 1780, the three ships brought in an impressive one hundred and fourteen prizes, eleven of which were retaken, seventy-six were ransomed, sixteen were brought in, one hundred and twenty six were paroled and eleven were lost, scuttled or burned. In the end, their reign of terror was only partially successful in respect to exchanging prisoners, for although they captured many, the British remained uncooperative for the most part, during prisoner exchange negotiations. But Franklin’s ships were successful in doing what had never been done before- wreaking havoc upon the "Mistress of the Seas", as Britain was then known. Ironically, toward the close of the American Revolution, Benjamin Franklin attempted to have a clause added to the peace treaty with Britain, prohibiting the practice of privateering in future conflicts. But despite the efforts of the good doctor, privateering continued to flourish. Much of this was due to the fact that the fledgling United States had no significant naval force with which to defend itself and that privateering was a highly effective method of accomplishing the young nation’s means. Privateering continued to be practiced by the United States throughout the Civil War. 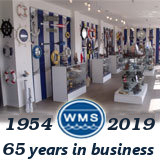 To this very day, our government still maintains the right "…To declare War, grant Letters of Marque and Reprisal, and make Rules concerning Captures on Land and Water." Benjamin Franklin’s involvement in privateering is an excellent demonstration of the old adage that "history is written by the victors." To the British of the 1770’s, Franklin’s privateering commissions were unlawful acts of piracy and could even be regarded as a form of terrorism. Had the United States lost the revolution, Franklin’s heroics would have been a hanging offense and he might have been remembered by history not as a patriot, but as a villainous pirate. But the purpose of this article is not to point the finger of blame at Benjamin Franklin and accuse him of piracy. But rather it seeks to admire the self-less determination of a man who went to great lengths for the sake of his countrymen and walked the fine line between patriotism and piracy- privateering!